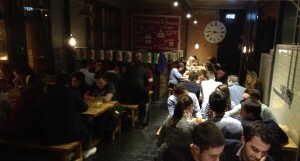 The spring edition of this biannual pub quiz was held at the Urban Tap House – a new venue to many of us in a city which continues to provide surprises! Organised by Young Planners Cymru and Planning Aid Wales, there was a great turnout from the Planning School, providing an opportunity for both an evening of socialising and networking. The quiz was a great social event, giving us an opportunity to meet outside of lectures and test our general knowledge against fellow planners. Beyond the friendly competition it also provided a chance to meet and network with established professionals – with teams representing a number of private consultancies and national government. Cardiff University and the School of Planning and Geography have strong links with both organisers, Young Planners Cymru and Planning Aid Wales, and events such as this are a great example of how meeting professionals can help develop contacts as well as friends. Our team came away winners by the smallest of margins following five difficult rounds. We started strongly, dropping few points in the opening two rounds and leading into the second half of the quiz. Despite making very few mistakes in the riddles and UK map challenges we fell to second with it all to play for as we entered the final round. Fortunately, a couple of team members illustrated their knowledge of the origins of Tupperware and the decade which saw the creation of sliced bread, which saw us come away proud winners of six bottles of wine. The quiz was rounded off with yet more wins, this time with a number of raffle prizes – with friends coming away with Easter eggs, yet more wine and a novelty corkscrew. Last night also made me realise just how many venues Cardiff has to offer. Now in my fifth year in the city it was my first experience of the Urban Tap House, opposite the Millennium Stadium. With a wide selection of local ales, lagers and some very impressive looking burgers it’s a venue which I will definitely return to, and I’d advise you to do the same! This week continues in the same vein for planning students, with a course social this evening before our Easter deadlines draw close – hopefully you will be able to read about this next week!